Cucumbers are often an overlooked food. Unless you're throwing together a salad on a hot summer day, you might not even think of including one in your recipes. But cucumbers have all sorts of merits. They actually can cool the blood, and they're 95 percent water so they're healthy, too. Pressing a slice of cucumber to the roof of your mouth for a minute can get rid of bad breath, and they even have a reputation as hangover-busters due to their high content of Vitamin B and electrolytes, although it's recommended that you eat one before you imbibe. Whatever you're using a cucumber for, you may not be a fan of its seeds. Here's how to get rid of them. Recipes that call for a seeded cucumber are usually looking for that light fresh taste that comes from the inside of the cucumber. The seeds can also add too much additional moisture to recipes if they're left intact, and the seeds in large, very mature cucumbers are just plain unpleasant to consume. Unless you're making a salad, you'll probably also want to remove the cucumber's peel. Use a peeler to remove the dark green outer skin. Slice off the ends first so you have an easy place to start and finish peeling with both the flesh and the skin exposed. Take the skin off in long strips. You can also use a sharp paring knife, but avoid taking too much of the cucumber's flesh with the peel if you use this option. Peeling a computer with a knife is a bit of an art. Cukes can be slippery, especially after they're washed, so you could easily cut yourself if you're not experienced with a paring knife. Photo © N. Gaifyllia, licensed to About.com, Inc.
Cut the cucumber in half lengthwise after you've removed the skin. Place a spoon at one end of each half of the cucumber at the start of the seed channel. Press the spoon down gently into the seed channel, facing down. Pull it toward you to scoop out the seeds. Repeat as necessary to remove them all, but you can usually get all the seeds in two scoops. "Gently" is the word here unless the recipe you're making calls for the cucumber in pieces. It will break apart easily without its peel. The cucumber can be sliced, diced or grated, depending on the recipe specifications, after the seeds have been removed. You should use it immediately, however. The cucumber will begin oxidizing as soon as it loses its skin, and this will turn it soggy. Tzatziki — a cucumber yogurt dip — is a Greek favorite. Tangy and creamy, it can be used to accent grilled meats and vegetables, or as a dressing on pita bread. Cool and crunchy cucumber salad can be a big hit, particularly during the hot summer months. Add tomato and red onion to a cucumber salad for some color. 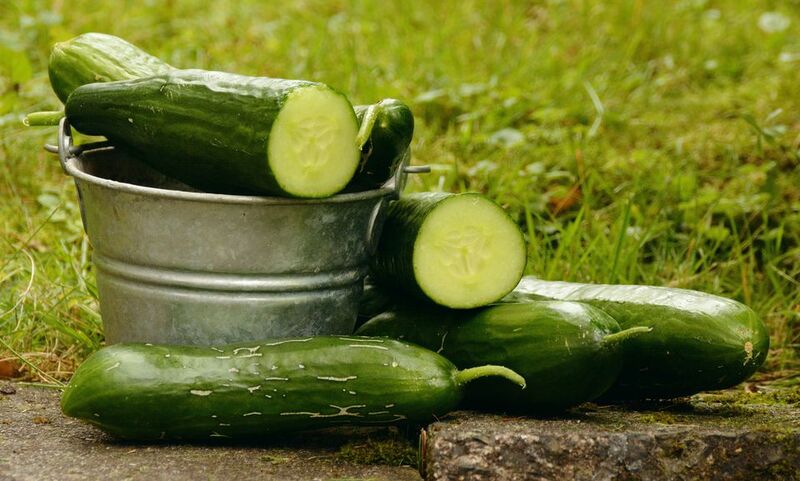 Cucumber is also a popular ingredient in southern dishes like deep-fried cucumbers, as well as in eastern European and Thai cuisines.